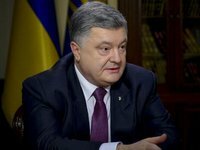 Ukrainian President Petro Poroshenko in an interview to Ukrainian TV channels stressed that Ukraine would struggle by all possible means for the liberation of Ukrainian sailors. "The relevant special services, Commissioner of the Verkhovna Rada for Human Rights Liudmyla Denisova and the embassies had been ordered to take all measures available to Ukraine to return the Ukrainians," he said in an interview with Ukrainian TV channels on Tuesday. On November 25, Russian border guards captured the Yany Kapu tugboat and two small-sized Berdiansk and Nikopol armored artillery boats of the Ukrainian Armed Forces' Navy heading from Odesa to Mariupol. After the seizure, they escorted the vessels to the occupied Kerch. The FSB opened a case under Part 3 of Article 322 of the Criminal Code of Russia (illegal crossing of the state border). Initially, the Ukrainian side reported about six wounded sailors, and the Russian Federation said about three seamen. On November 27, First Deputy Chairman of the Verkhovna Rada, representative of Ukraine's president for a peaceful settlement in Donbas, Iryna Gerashchenko, said that among the captured sailors there were four injured and one in serious condition.